Bridal Trials are not necessary but we highly recommend doing a practice round! We’d like your wedding day to be stress-free and relaxed! Our part in that is having a good hair plan ready to go! Sometimes it is not possible if the bride is out of town and just can’t make it work. It is still a good idea to set up some time to talk to your stylist about your hair and the style you’ve chosen. There are lots of styling tips we can give you that will make the wedding day hair perfect! A trial is important because then you will know that the style will work with your hair and that you’ll like it! So often we do the exact style the bride has chosen and she says it’s just not her! It’s not uncommon for this to happen. You never know until you try. 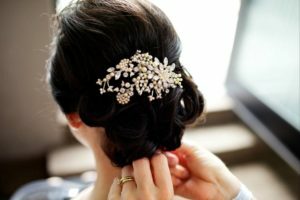 The day of the wedding is too busy to not be sure about your hair! The trial can be done at any time. Months or days before the wedding. Preferably it’s best to do as soon as possible. It’s nice to know ahead of time that you are all set! Some styles don’t require super long hair, so it’s good to know that you don’t need to grow it for months and not like it along the way. At the time of the trial, we talk about what you like and go over our options. Bring lots of photos of hair styles that you like. I like to always try down and up styles. Most brides know right away what feels right. At the time of the trial we can go over what’s best for your hair to prepare it for the wedding. When to shampoo, what styling products work best and any other tricks that we’ve learned along the way are important things to know! I’m not saying that you are locked in to the style we do at the trial! You can always change your mind! It’s better though to only do one look the day of the wedding. On the day of the wedding it’s really hard to do a style and then take it down and try something else. I like to spray and tease and pin as we go so that it stays all day and night. If I need to take that down the teasing and spray can make the hair look frizzy and the hair can start to separate. Once we’ve chosen your hairstyle the wedding day is a breeze! It’s nice to know that your hair will be exactly what you envision. It’s fun to check “bridal hair trial” off the list too!